The oriel window was destroyed by bombing during the Second World War. 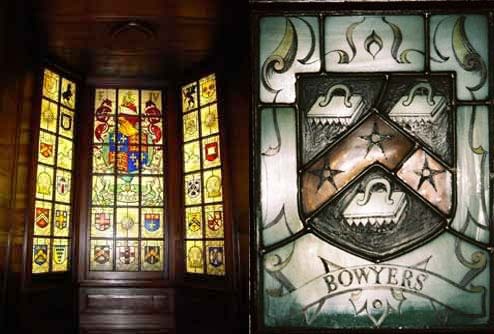 It was restored in 1969, to a design by Carl Edwards, and includes the shields of the nineteen Livery Companies and Guilds, including the Bowyers, who were using the Hall at the time and who were generous contributors to the cost of the window. The Company continues to dine regularly at Tallow Chandlers' Hall. The arms occupying the centre of the window are those of Edward VI, in whose reign the Tallow Chandlers received their charter and acquired the site of their Hall. The Tallow Chandlers Company was formed in about 1300 by oynters (tallow melters), as a religious fraternity in honour of Our Lady and St John the Baptist. It expanded in membership and influence over the next 150 years, until in 1456 it was granted a coat of arms, and in 1462 full livery status, by King Edward IV. The site of the Tallow Chandlers' Hall, near Cannon Street Station, was purchased in 1476. The modern Hall, a Grade I listed building, was built in 1672 after the destruction of the original hall during the Great Fire of London. Having survived the Blitz, it is one of the few Livery Halls to remain unchanged since the 17th Century. The Company was formed to regulate oils, ointments, lubricants and fat-based preservatives and to manage candle making using animal fats (tallow). It was one of many livery companies managing the interests of, and policing, a particular area of commerce. Its influence was not exclusively confined to tallow. Its role broadened out to encompass various other domestic goods, until it oversaw products including sauces, vinegar, soap, cheese and herrings. The Company was also intimately involved in the service of London. By 1415 tallow candles played a key role in the compulsory street lighting for the City of London. By 1469, it was already supplying the City Watch with 60 men. However, the end of the 17th century saw a decline in the Company's fortunes. At first, new candle making materials, such as spermaceti and paraffin wax, replaced tallow. The subsequent introduction of gas lighting in the 1800s and electric lighting in the 1900s further eroded the company's long established position. However, the facility of tallow as a raw material for the industrial manufacture of soap greatly expanded as the Victorian chemical industry developed. In 1853 Palmerston removed the duty on tallow in order to cut the cost of soap in support of the growing concern with hygiene and cleanliness. Such change was not exclusive to the Tallow Chandlers. Few livery companies maintain their original role of policing a specific area of commerce. There are some exceptions; gold is still assayed at Goldsmith's Hall, pharmacists sit their exams at Apothecaries' Hall, the Vintners are still involved in wine regulation and the Watermen still control professional standards on the Thames. Today, the Company exists as a charitable and social body supporting various London based charities and retaining strong links with the lighting and edible oil industries, through various candle manufacturers, FOSFA International (the Federation of Oils, Seeds and Fats Associations). It has also formed new trade links with the mineral oil industry through BP.